Imagine for a moment being in a town where people have never been exposed to dogs: they know what a dog looks like, because they’ve seen pictures of them, or maybe seen them from a distance when they travel to other places… but they’ve never actually petted a dog, or walked one on a leash, or even spent five minutes observing one. Now, some kook in the town wants to make it legal to keep pet dogs in the dog-free town. “They will poop in the yards!” people exclaim. “They will bark and make awful noise, and they will chase our cats!” “Some people might even let their dogs in the house – just think of how unsanitary that would be, and how dangerous to the children!” The townsfolk, having never been exposed to the companionship of dogs, are opposed. Some bring up the scenario of dogfights, which attract gambling and other unsavory activities. The dog-loving kook is fully supportive of a standard leash law, and that all dog owners should have to purchase a license from the city every year for every dog. He supports requiring immunizations against dangerous diseases (like rabies), and the owner’s maintaining proof of such. Many of the townsfolk mill about in opposition to the kook’s crazy dog plan, but little by little, respectable ordinary people step forward, cautiously expressing a willingness to consider the idea. “My brother has a dog,” said one, “and he keeps burglars away from the house when my brother is gone.” Another explains that she’d really like for her aged mother to have a dog for companionship. Someone else mentions they’ve heard that dogs can actually be trained to assist the blind. All of these people are in favor of reasonable limitations – no one suggests just letting the dogs run wild, stealing suppers from the table, biting children, and pooping on the town hall steps. Can this hypothetical town accept change? Is there any possibility that they can get past the fear of the unfamiliar, to find the benefits of a companion animal who helps guard their home, gives them a reason to go outdoors and walk, and offers unconditional love each day? Now, turn your imagination 45 degrees, and see that the hypothetical town is our town. The discussion is not about dogs, but about chickens. The proposed regulations would be similar: roosters would not be allowed (thus eliminating the noise component), the number of birds would be limited, confinement to the back or side yard would be required. Registration and purchase of a license would also be required, just as it is for dogs. The benefits are slightly different, but comparable. Can this town ever get past its paranoia to try something new? The format of tonight’s forum will be that each question will be answered by two candidates, then they’ll go on to the next question, and next two candidates answering. With ten candidates in the running, it should be answering. Tom Beehan opens with a brief biography. He has been on City Council for eight years. We’re beginning to address the issue of crime in our neighborhoods with increased patrols; we’ve begun to address housing and our older neighborhoods. Lastly, we’re improving retail, particularly in working with some of the small retail neighborhoods like Jackson Square. Jimmy Bouchard is introduced next; he doesn’t think that experience should be measured for this office, as he comes from the “best high school in America.” The high school senior will turn 18 on May 22, qualifying him for office. He says that he will not vote his own convictions, but those expressed by the people. He plans to major in nuclear engineering at UTK next year. He’d like to diversify the city’s economy by supporting small businesses; he’d like to go ahead and build the new senior center that was promised. Anne Garcia Garland follows, citing that she no longer has any ties to special interests like DOE and their contractors. She’s not entirely happy with the way things have gone recently, with a Council who claims to know what is best. “Oak Ridgers need to decide who we’re going to be when we grow up.” We need to take care of the existing retail we have, in order to encourage others to come. John Alex Groff works at ORNL, at the SNS. Vision for Oak Ridge: the population today is the same as it was when he was born. Growing the population depends on growing the industrial base. Why haven’t we tried to entice some of the off-road industry to Oak Ridge, with more than 700 miles of off road trails nearby? Rick Hasbrouck notes the lack of retail, and that improving retail would ease the property tax burden. We need to add police officers rather than relying on overtime. Says that he is new to Oak Ridge. Martin McBride: undergraduate degree in physics from the University of Delaware, married 35 years. Got his graduate degree in bionucleonics. Worked the cleanup at Three Mile Island, then moved to oak Ridge to work for DOE. Jane Miller has been an Oak Ridger since the age of three; she works in PR for BWXT. She is disappointed in the last couple of years, but thinks that we’ve gone overboard with citizen input to the point of not being able to accomplish anything. We need to be more flexible, more business-friendly, and need to treat our citizens as our customers. Small, one-issue groups should not be able to halt progress; public input is important, but Council must make the hard decisions. We need that can-do, Manhattan Project attitude that we’ve always had. David Mosby, trusted for the last eight years on Council, is “ready to continue the work that we have started.” Property tax revenue has been increased about $1M from the new, privately-owned DOE buildings. Supports new initiatives like the recycling plan, the sustainability plan, and the acquisition of hybrid vehicles for the City. We have to find better and more effective ways to combat crime and drugs. We need to pay attention to our seniors, and to keep the pressure off of our property taxes. Eric Tobler, an Oak Ridge native (1983 graduate), worked for Bechtel then Y-12. Following a boating accident, he started Tobler Enterprises, which is both a landscaping and development enterprise. Owns residential and retail property in Oak Ridge — if OakRidge fails, he will fail. Tony Turner is a West Point graduate. Followng his military retirement, he settled in Oak Ridge — his first hometown. He is the program manager for Homeland Security at ORNL. The City needs leadership now, vision + action. Stan Mitchell asks: what does the City need to do to get citizen support for projects? David Mosby responds that citizens have ample opportunity for input, and that they exercise those opportunities. Tobler: Council needs to share what their goals are; we’re not sure what the goals and vision are. If Council would show their plan to the citizens, then people would understand where we’re going. It seems like all the talk is about taxes. Q) What do you think the City could do to attract more young families, and what will happen if we don’t? McBride: The City has a problem due to certain constraints. We have, for so long, allowed people at ORNL and Y-12 to drift away from Oak Ridge, so when someone new comes in, they’re surrounded by people who live in Farragut instead of here. First, we have to get them interested in coming here. Garland: We need a different approach. We need to concentrate in attracting the kind of families who would want to live here; for people who want to escape big city life and rat races elsewhere. We should advertise to specific target audiences. If we can make the town feel friendly to small business, that’s who takes the risk. Beehan: Because of a different relationship with DOE, we didn’t have to raise property taxes. Some of the innovations like the private buildings are really helping. The stimulus and cleanup programs have insulated us from the woes that other cities are facing. DOE is the 900-lb gorilla in town, and the best way to deal with it is to work with them. Groff: Growth is the answer. We can grow through industry, retail, or commerical, but we have to grow. We have to market ourselves to these businesses. We have to work with City staff to help them understand we must bend over backward to make business welcome. Voted against Crestpoint, but now realizes his error. Q) Is there anything specifically that we could do as a City to attract more retailers? Bouchard: Retailers look at many different aspects, such as demand and demographics. It’s hard for a city our size to attract them, unless we show that we can attract more people to live and shop here. A tax abatement would show that we are committed to helping them. Hasbrouck: Need to work closely with the Chamber of Commerce; we need to advertise to let others know that Oak Ridge is open for business. The realtor that was bringing Target, is no longer interested in working within Oak Ridge. Q) What do you think should be the City’s #1 priority? Miller: Jobs, housing, and retail. We’re fine on jobs, we’re improving on housing, but our main problem is retail — one of the two only ways to get money into the City. We can’t address other things until we fix that problem. Turner: Crime is our most pressing issue. We have a higher crime rate than most of the rest of Tennessee. Most of our crime is driven by the drug trade. Anderson County is the only county in our region that is not affiliated with the High Intensity Drug Trafficing Area effort. Q) After a string of home invasions, has the additional overtime patrols and neighborhood watch been effective? Hasbrouck: I haven’t seen the stats to know if we’re making progress or not. Instead of overtime, we need to expand the police force. Police and landlords can solve the problem. Groff: I think these measures have been effective. Criminals are getting caught, but they’re getting smarter. They’re carrying smaller amounts of drugs, not carrying weapons, so they get less time. We have eighty-some people in the police department, but only half of those on patrol. We have eighty-some personnel in parks and recreation. Overtime is not the answer. We can’t afford to have someone out there who’s been working 16 hours straight. Q) Roane State is trying to raise $5M; do you support the City contribution of $500k. Mosby: I’m concerned about the repayment method, but appreciate the benefit that Roane State brings and think it will pay dividends in the long run. McBride: I fully support that. Where is the money coming from? I would reduce the City’s lobbyist contract to find (part of) the money. Our schools need continued funding increases, along with police and fire. We must prioritize, and we take money from things at the bottom of the list. Q) How does the City move forward, while preserving our historic areas? Tobler: We cannot hold on to dilapidated buildings; if somehting must be preserved, could we use volunteer effort to do so? Sometimes, volunteers are chastized for their efforts. Garland: If we’re going to move forard, we have to know what direction “forward” is. Am not necessarily a proponent of growth for the sake of growth. I support any and all historical projects that do not require the City borrowing money. Q) What is your take on the marina redevelopment? Miller: I am in favor of the redevelopment. I don’t want to harm the natural beauty, but think that we should have appropriate restaurants, restroom facilities, human-powered sports businesses. But, we have to work with the developer, because the City does not have the money to fund it. Does not want motorized boats there. Bouchard: development of the marina is crucial. The development shows that Oak Ridge cares about the options and opportunities, but we’ve done very little to promote the second-best rowing venue in the whole country. Q) What is your position on red light and speed enforcement cameras in Oak Ridge? Turner: I’m against the cameras, because of the very emotional reaction generated amongst the citizens. I did not find a competting reason that justified installation against the will of the citizens. Beehan: The cameras are part of an overall program to protect the children in this community. The red light cameras are the same kind of technology as radar was a few years ago. We have new school zones, we have crossing guards, and we’ve gotten a safe schools grant. The cameras are not about revenue, they’re about safety. Q) The majority of people at the DOE facilities live outside Oak Ridge. Why do you think that is? Groff: One of the reasons is because that’s where their co-workers live. Once people get in the hands of Knoxville realtors, they’re lost to us. We need a relocation specialist. We have so much that Knoxville doesn’t have, but people don’t know that. Hasbrouck: It’s not just DOE, it’s a lot of our employers. A lot of it is that the Knoxville realtors get to them first. Part of the problem is that our property tax rate is so high. Red light cameras won’t help, either. Q) Do we need a new senior center, and how do we fund it? Miller: I think we’d all love to see a new senior center, but until we have more revenue, we cannot address these new issues (like police, Roane State, etc.). Beehan: I’d love to have a new senior center, but we’re in a 5-year contract with the current building. The building is only a place — we also need to look at the services offered, and those may be located elsewhere. Back to police, no one is working 18 hours. We are applying for five new officers under the stimulus funding. The best way to address the problem NOW is to reward our officers with overtime. Q) If you’re elected, how would you operate as a leader? Bouchard: If elected, I promise that my seat will be a seat for the people. No small group should hold up anything, but public opinion matters a great deal. I will bring enthusiasm, a new viewpoint. We need to target the 18-35 age group. Turner: Leadership is the ability to influence people. I have the ability to follow through. Q) Share your opinions on west end development? McBride: One of our significant challenges is that we’re a long, thin city. The west end looks like a golden opportunity to develop retail centers, which turn out to be quite important. One of our largest new developments is on the extreme west end, and we’ve invested a great deal in the infrastructure to get there. We are in competition, and we have to develop the entire city. Garland: Ditto. If we can continue to encourage people to love their neighborhoods, we should do just fine there. Q) The City has a tax abatement policy, awarding levels of support depending on the level of investment. Do you support it, and why or why not? Mosby: I support an abatement policy. The abatement doesn’t make the deal, but is considered as something factored into the business plan. It needs to be flexible, but structured enough so that there’s a reasonable assurance of a return on investment. I would like to see it change to address the under-utilized properties, and try to help us grow the west end. Tobler: Tax abatements can be a good thing, but need to be considered individually. Big businesses push for them the hardest, but the small businesses usually need them the most. We need to be ready to negotiate, so that more money can come back to the city once they’re on their feet. Turner: I have no idea why they would not. We need to talk to the new employees and tell them the positive things about Oak Ridge. Q) The percentage of economically disadvantaged kids in the school system is reaching new highs. what would you propose to do? Tobler: Get with the school board and empower them to do what needs to be done. Q) Will you support a property tax increase to finance the city’s needs? Mosby: it depends. I ama proponent for trying to hold back on tax increases by finding new revenue sources, such as by the new alternative financed DOE buildings. We’re trying to become more efficient. Q) What are your plans for the waterfront, and have we asked for input from our rowing customers? Miller: The city has been involved with rowing, and have an ongoing good relationship with the rowing community. I’m not sure if we can measure the return on investment, but it’s a quality of life issue, and I don’t want to see it go away. Q) How do you feel about fees, tolls, wheel tax on non-resident workers? McBride: Memphis has struggled with this, having the highest property tax rate in the state. I don’t favor that kind of option, because we might damage the relationship with those kinds of tactics. I prefer a congressional investment, due to the service we provide for the nation. Q) Should Oak Ridge focus on manufacturing business on the west end, being closest to the interstate? Hasbrouck: We need to focus on business everywhere in the city. Q) What steps will you take to improve housing, through incentives to homeowners? Groff: There are several programs at the lab that deal directly with residential energy efficiency. Unfortunately, none of those are in Oak Ridge. Why not? Q) Should the City use eminent domain to acquire the Alexander Inn for renovation? Garland: I don’t really know the parameters. I would reserve eminent domain for only the most critical community projects. Taking property is pretty un-American. We should have codes to prevent property owners from allowing their property to deteriorate. We can condemn, but we cannot just take. Q) How will you ensure that a developer who commits to a major project, will follow through and complete the project? Bouchard: I would carefully consider the project at the outset, before it is started. Follow through should be ensured before the developer begins. Q) How can we encourage more business on Illinois, and keep Woodland homeowners happy? Beehan: I don’t know. We did a corridor study which now establishes guidelines as to how far you can go into a neighborhood, so now developers know what they can do, and homeowners know what they can do. We’ve done good studies on the marina, and on sustainability; we could build consensus on other subjects as well. Q) Is there too much cooperation with the Chamber of Commerce? Turner: Since we have a contract, the relationship really should be client-customer. But it needs to be more than that; it should be cooperative. The Chamber does what it is called to do in its contract. The relocation specialist is a tremendous opportunity. The City could listen more to the chamber, particularly in removing the obstacles to new businesses coming in. Q) What do you recommend to change the image of becoming old, to becoming younger and more vibrant. Tobler: promote the lake and the schools. bring people from Knoxville to events in Oak Ridge — concerts, etc. We need to create places for people to have fun. Q) If you could only accomplish one thing, what would it be? Mosby: I would like to see the community figure out that it is a special place, and develop into something that is attractive, so it’s not hard to entice people and businesses to come here. Q) Do you support capping property taxes for seniors, based upon economic need? Miller: I think we need to study that, and we need to do that. Q) What action plan to you have for a serious effort to develop the Oak Ridge Mall? McBride: The mall occupies a very central place in our city. No meaningful progress has occurred in the last 7 years. We need to take initiative on the mall covenants; Wal-Mart has an incredible amount of influence over the rest of the property. We need to approach Wal-Mart and ask for a break on the restrictions. Q) How can a city like Maryville/Alcoa have extensive retail, when Oak Ridge doesn’t? Hasbrouck: I don’t know. There is opportunity in this city. All of the anchors have stipulations in place at the mall; maybe that’s where we need to consider eminent domain. Q) Where do the schools fall in your budget priorities? Groff: I have two kids in school. Education is #1 priority. We have to focus on increasing education. I’d like to see the vo-tech programs come back. Q) What would you do to help the older retail centers? Garland: We need to make adjustments to our sign ordinances, with signs on the turnpike for these business areas, directing traffic to these off-turnpike shopping centers. Advocates forming a “small business” chamber of commerce, to strengthen their influence. Q) What are your suggestions for older housing? Bouchard: I am a proponent for reinforcing our residential neighborhoods. We could extend incentives to homeowners to improve their buildings; the City could do something with the properties that have fallen under par. The City could revise one portion of the city to like-new 1940s condition. Q) What would you propose to reduce crime in Oak Ridge? Beehan: I would call a meeting of the police chief, sheriff, and district attorney, to establish cooperation and run the drug dealers out of town. We need to bring on the five new police officers. The neighborhood watch program is very successful, and I’m very proud of them. It’s incredible the things that are happening. Q) When consensus cannot be achieved, how to proceed? Turner: on Council, the majority wins. That doesn’t necessarily work with the citizens. But at some point, you have to lead — vote your vision. Tobler: you’re never going to make everybody happy, so you have to make the best decision for the city. Mosby: A lot of times, we bail out before consensus can be reached. Miller: Just the people at the microphone doesn’t necessarily represent the majority — phone callls and e-mails also factor in. McBride: the high school project was the best example of building consensus. The more that Council can do that, the more successful we’re going to be. Hasbrouck: Consensus is a difficult thing among seven people, much less 27,000. That said, more surveys would be a useful thing. Groff: Dissent gives you the opportunity to explore the reasons for differing opinions. You want everyone to walk away feeling like they got a good deal. Garland: I don’t think the citizens expect consensus, but they expect an opportunity to be heard and considered. Bouchard: Communication goes hand-in-hand with consensus. Beehan: Consensus is good and I wish we could do it on every issue, but that’s not possible. We do get a lot of communication, especially via e-mail. There are issues where we do need to communicate better. Ultimately, our job is to make the best decision we can based on the information we have. It’s like sausage — you like the end product, but making it is not pretty. The forum will air on BBB (channel 12). Air times will be posted on www.bbbtv12.com. Although most of the nation waited expectantly for news of who will be our next President, I fell asleep before even the local results were in. It was a long day for me, campaigning for the ten candidates I supported for Charter Commission. I couldn’t vote for all ten, obviously — and it was hard to narrow my choices down to seven. But they’re a fine group of people, including some folks new to city politics that I hope to see on the ballot again someday. Five of ours were elected: Gene Caldwell, Pat Postma, Leonard Abbatiello, Chuck Agle, and David McCoy. Girlfriend pointed out in an early morning e-mail that the youngest one elected is 50-something… wondering if some of the town’s seniors bought into the idea spread by some of the opposition that the future of the Senior Center depended on election of the "right" candidates for Charter Commission. That’s just silly, of course, but no sillier than some of the other half-truths or outright falsehoods spread during the campaign. I’m also grateful for our five candidates who ran but were not elected: Mary Helen Rose, who is knowledgeable about the Charter; Ella DuBose, who served on the Charter Review Committee and is someone I’d really like to see continue in public life in Oak Ridge; Paula Flowers, a relative newcomer to Oak Ridge but with tremendous expertise and insight into the types of issues we’re dealing with; Scott Linn, a history teacher at Jefferson who is reasonable, personable, and brings perspective to our challenges; and Mike Mahathy, a health physicist who is a bundle of energy with great ideas, and committed to the future of this City. Everyone put in a great deal of work, with most devoting as much (or more) effort to the success of the whole as to their personal campaigns. That, to me, is a tremendous statement of readiness for public office — a willingness to put the success of an idea or effort above one’s personal goals. Folks, my hat’s off to all of you. Jerry Marrow writes, in a letter to the Oak Ridger today, that "there is danger on the horizon with the election of this Charter Commission." Like most small towns, our city has been run for the benefit of a few. The rest of us pay the highest taxes in the state and get the least amount for it. We’re number one. Um, no. We all pay the same tax rate. Even businesses that receive tax abatements, like Bristol Place apartments, are still paying the same tax rate as everyone else… the abatement just defers taxation on the full value of their improvements for a few years. So, they’re still paying a lot more in property taxes than they did before the development. And they’ll pay even more after the abatement period. We’re all taxed equally; businesses pay taxes on 40% of their assessed value, and homeowners pay taxes on 25% of their assessed value. It’s all the same tax rate. Secondly, our tax rate is not the highest in the state — see for yourself. With a combined City/County tax rate of $5.45 (that’s the Anderson Co. part; the Roane Co. part is lower), compare that to Memphis ($7.29), Germantown and Bartlett ($5.63), Knoxville ($5.50), and others. Yes, our tax rate is higher than most. However, we get more than most — would you compare our schools, our police department, our refuse removal, to any of those places? We get a lot of bang for the buck in Oak Ridge. The term for a council member would be two years. These people are like gym socks, you can’t change them often enough. I challenge you to ask anyone who has served in local elected office — current or former — if their first two years of service were the most effective. I’m confident that every one would concede that there’s a learning curve, and that they became more effective once they came up to speed. So rather than gym socks, let’s use a little different analogy: would you change dentists every two years, because it’s better to have one fresh out of dental school than one with more experience? We should have district representation with the council member living in that district. I do not trust and neither should you trust somebody to take care of your district that doesn’t live there. As I’ve documented before, my area and your area is being cheated out of city monies. Oak Ridge is small enough that people living in the various geographic areas (voting precincts?) have much more in common than differences. The population of ONE Nashville City Council district is more than half the size of all of Oak Ridge — and they have 40 people on City Council, not counting the Mayor! The last part of his blurb is one that you should think about very carefully: in the previous paragraph, he complains about the tax rate. Next, he wants more spent on his district. Is it not natural to conclude that, if Council members were elected by district, each would want more spent in his or her district than in others — regardless of need or overall benefit to the City as a whole? Think earmarks and pork-barrel spending. Lastly, the allegation of some areas being "cheated out of city monies" is very serious, but no specifics are offered. It’s instructive to note that the district (precinct) that has received the most in city expenditures during the term of this Council — Highland View — does not have a Council member residing in that district. I could go on, refuting his errors line-by-line until the end, but the picture should be clear enough by now. Early voting begins a week from tomorrow; visit www.OakRidgeCharter.com and get information on the issue and candidates. You can vote for seven… it might be wise to make your list. Since some folks decided that we need to study and perhaps revise the City Charter again (it was just done in 2004, and updated last month), I thought it would be worthwhile to really study the political history of Oak Ridge. First of all, what did districts look like in Oak Ridge? Not surprisingly, they looked a lot like our current precinct structure… except that we had a couple extra precincts then that we don’t have now, and we’ve added a couple that we didn’t have back then. "Elm Grove" is now part of Glenwood, "Linden" is split between Robertsville and West Hills, and Oak Hills is now its own precinct — the city’s largest. Hendrix Creek is made up of neighborhoods that didn’t exist back then, as is Lawnville (Rarity Ridge). Cedar Hill was later split between Glenwood and Pine Valley, I think. If that’s as clear as mud, perhaps a map would help. 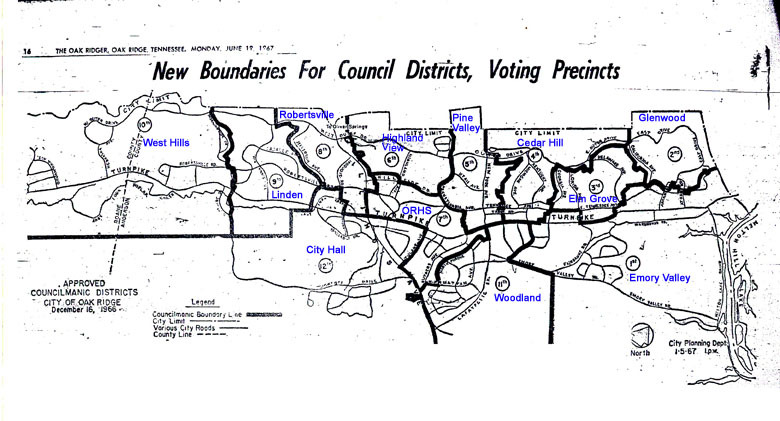 Council members were elected only in the districts they represented from 1959 to 1974. From 1975 to 1986, council members were nominated by district (required to live in the district), but were elected at-large by voters citywide. A couple of things caught my attention from those years: in the earliest phase, some candidates were elected to make decisions affecting the whole city with only a minimum number of votes — one with as few as 117, and quite a few with less than 200. In the second phase, where district representatives were elected at-large, sometimes the candidate who won his or her district did not win the confidence of voters throughout the city, and someone else was elected to represent that district. Presently, we don’t have districts. Candidates run at-large, and the top three or four vote getters (depending on which cycle of staggered terms we’re in) are elected. All are elected at-large, all represent all citizens. On a positive note, if I call one city council member and don’t feel like my concern was given fair consideration, I can pick up the phone and call another one. And another. We get to pick the one we like best, not necessarily the one who lives closest. Obviously, I think the present system works best. I don’t see how makng it easier to elect someone with fewer votes could possibly be a good thing for Oak Ridge. But I do remain interested in why some people feel unrepresented, and exactly what they would like our representatives to do differently.